Before :- Viswanatha Iyer, J.
O.P. Nos. 2866 & 3005 of 1983. D/d. 17.4.1989. For the Petitioner :- N. Raghava Kurup, Advocate. For the Respondent :- Kallada Sukumaran, Advocate. Viswanatha Iyer, J. - I shall state the facts in O.P No. 3005 of 1983 as the pleading therein are complete and it involves a point additional to G.P. No. 2866 of 1983. 2. The petitioner is having two industrial service connections with con summer Nos. 2207 and 2628 respectively. Both these connections are three phase connections. The first of these connections was given on 18.10.1975 and the other on 29.3.1978 when the unit was expanded. There are separate meters installed for these connections and the petitioner has been paying the consumption charges demanded as per the meter readings. While so, the petitioner was served with two demand notices Exits. P1 and P2 calling upon him to pay what was termed as arrears from 18.10.1975 to 18.10.1983 in case of connection consumer No. 2207 and from 29.3.1978 in case of connection No. 2628. The amounts demanded were Rs. 1,49,2,93,55/- and Rs. 1,17,855,34/- respectively. Petitioner was threatened with disconnection, if the amounts were not paid before 14.4.1983. He therefore filed this original petition and obtained an interim order of stay of disconnection. The petitioner contended that he had been paying the charges regularly as per the meter readings, and if the meter was not functioning properly for any reason, the respondents were bound to make reference of the dispute to the Electrical Inspector under Section 26(6) of the Indian Electricity Act,(the Act) and that they cannot make demand for such additional amounts without such reference. There was also a point raised about violation of the principles of natural justice. The petitioner had a further contention that he had been manufacturing rubber product and marketing the same at prices commensurate with the electric charges paid by him hitherto. The unit itself is a small scale unit financed by banks and other institutions and if additional demand is to be made, it will lead to calamitous results as the petitioner cannot recover the price which would have been charged for the goods already supplied if the electricity charges were on the scales contemplated by Exits. P1 and P2. A plea of estoppel by representation is therefore raised against the demands made in Exits. P1 and P2. 3. The counter affidavit filed on behalf of the respondents points out that the petitioner was having three phase connections. The meters and the current transformers installed in the premises were tested for accuracy and the connection verified on 26.3.1983 by the Works Manager, T.M.R. Division of the Board on receipt or a request from the Assistant Executive Engineer at Ettumannoor. It was then noted that the CT connection to the first element was in reverse polarity resulting in reverse torque. Out of the three phases (all of which have to run forward) one was therefore in reverse and cancelled the forward torque in another. Only the third one was in forward motion with the result the meter recorded only one third of the actual consumption. It was based on this additional amounts demanded from the petitioner for two-third of the actual consumption. 4. The petitioner stated in reply that the meter had to be inspected and tested by the officers of the respondent Board as required under Section 20 of the Act. Section 26 (4) of the Act requires the respondents to enter into any premises for testing only after informing the consumer about it. The petitioner had no such information. It was also stated that the Works Manager of the Board had no authority to direct revision of the bills. The defective nature of the meter had not been brought to the notice of the petitioner. The respondents had no case that the petitioner had tampered with the meter. Therefore, the enhanced demands have arisen only because of defective metering which requires reference to the Electrical Inspector under condition No. 43 of the Conditions of Supply. Petitioners contention is that since respondents had made demands for additional charges right from the installation of the meters, it was obvious that the meters had been defective right from the beginning, that is even before they were installed. 5. On this, reply affidavit being filed, responder came forward with a rejoinder in which they pointed out that the meters installed in the petitioners premises have got current transformers attached to them to reduce the current flow through the current coil of the three phase connection. There transformers are mounted outside the meter so that they could be operated even without tampering the seal of the meter. The secondary wires on the three phases are connected to the meters with the positive wire connected to the incoming terminal and the negative wire to the outgoing terminal. If polarity of one of the phases is reversed, the torque produced in that phase will go in the reverse direction while the torque in the other two phases will be in the forward direction. The reverse torque in one phase and the forward torque in another will cancel each other and therefore, the resultant torque in the forward direction will be only one third. The discs of the meter will rotate in the forward direction, but only with one third speed. The reversal of the polarity can be brought about by inter-changing the connection at the meter terminal or at the current transformer secondary terminal or by inverting one current transformer upside down. For interchanging the connections at the meter terminal, the meter cover seal has to be broken but for the other two, the seal need not be broken. The terminal covers of the meters of the petitioners premises were intact. Therefore, the reverse polarity of one of the phase was brought about by reversing the wiring from the secondary side of the current transformers in one phase mounted outside the sealed meter. The change of polarity could not have happened without the petitioners knowledge. At the time of the inspection by the Works Manager the petitioners representative was present and he was informed about the testing. After the testing was done, the Assistant Engineer has furnished full details in respect of the two consumer connections of the petitioners on 8.4.1983, inviting objections, if any. Copies of these letters are Exts. R1 (c) and R1(d). 6. Petitioners has raised numerous contentions, but I am going into all of them as I am inclined to allow the original petition on the preliminary ground of violation of principles of natural justice in the issue of Exts. P1 and P2. The petitioner points out that he has paid the charges regularly as per the meter readings. The meter reading or any subsequent tests of the meter should be done only after notice. The meter is liable to be installed in the premises only after it has been properly tested. Under Section 26 (6) of the Act if the meter is faulty, the matter has to be referred to the Electrical Inspector and the consumer is liable to pay charges only on average consumption as stated therein. The petitioner was not afforded any opportunity to be heard before Exts. P1 and P2 were issued to him and therefore, there is violation of the principles of natural justice. The demands are made from the date of installation from which it is evident that the respondents have defaulted in their statutory duty to test the meters before installing them in the petitioners premises. There is also estoppel against such exhorbitant demands made after long laps of time on the ground of under billing. 7. At the time the petitioner filed the original petition, he had no means of knowing the reasons which led to the issue of the additional bills Exts. P1 and P2 because the notices Exts. R1 (c) and R1 (d) had not been served on him by that time. It was only by the counter affidavit that the case of the respondents stood disclosed, after which the supplementary pleadings cropped up. I must here mention that I have had occasion to come across quite a large number of cases relating to supply of electricity where huge additional bills are served on consumers demanding payment within a short time, without any explanation whatsoever as to how the demands have arisen. When the consumer is making payment of the charges regularly on demand, he is entitled to be informed in clear terms as to how the additional liability has accrued or arisen. Mere service of a bill without anything more is in circumstances grossly improper. The Electricity Board and its officers are bound to explain and inform the consumer as to why the additional demand is made and as to how the amounts already paid are inadequate. Complete details have to be furnished to enable the customer to know why he is being visited with additional liability to enable him to take remedial action, if any. It is unfortunate that the respondent Board and its officers do not follow this elementary procedure which is only in consonance with natural justice, when issuing bills for additional amounts. By adopting such a dubious procedure, the consumer is compelled to make payment of the demand sometimes very large within the short time of one week to avoid disconnection, without his having any opportunity to have his say in the matter at all. 8. Though the petitioner's case is that the meters in question were faulty right from the beginning based on the call for additional charges from the date of installation itself, the case of the respondents is that the meters were not faulty, but that there was tampering with the wiring. The secondary wires outside the meters were adjusted in such a way as to cause reverse polarity in one of the phases with the result the discs of the meters were running slowly recording only one third of the actual consumption. 9. The case of the petitioner that the meter was faulty and that the matter requires reference to the Electrical Inspector under Section 26 (6) does not therefore call for acceptance. Even otherwise, and if the dispute pertained to the meter, it was equally competent for the petitioner to apply to the Electrical Inspector for resolution of the dispute. That has not been done. 10. Having heard both sides. I am of the view that the demands as per Exts. P1 and P2 have to be quahsed on the preliminary ground that they have been issued in violation of the principles of natural justice. It is true that there is controversy between the parties as to whether notice had been issued before the meters were tested on 26.3.1983 by the works Manager of the fist respondent Board and as to whether the Works Manager was competent to do so. I do not however intend to go into these matters because Exts. P1 and P2 have to fall on the preliminary ground of violation of natural justice. 11. Exts. P1 and P2 make demands for very large amounts by way of additional charges for current consumption. The case of the respondents is that the petitioner has been guilty of tampering with the electrical system resulting in the meter recording only one third of the actual consumption. When serious allegations of this nature are made against the petitioner, it is only elementary justice that he is heard before he is visited with the consequences thereof, and called upon to make payment of large amounts by way of additional charges. Even the respondents seem to have recognised the necessity for such notice and hearing as is evident from the case set up by them in the rejoinder that two notices Ext. R1(c) and R1 (d) had been issued to the petitioner on 8.4.1983. The demands Exts. P1 and P2 visit the petitioner with serious civil consequences and he is now being. 12. The demand in this case is from the very date of installation of the meters. Whether this is justified in any event is also a point arising for consideration. The petitioner could not however put forward his case in the absence of any prior notice before being threatened with disconnection on 14.4.1983. After service of the demands Exts. P1 and P2. 13. I am not therefore, going into the various contentions raised by the petitioner, including the plea of estoppel, though prima facie I do not find any substance in it. I leave those questions open. The notices Exts. P1 and P2 are quashed. Petitioner may put forward his objections to the notices Exts. R1(c) and R2(d), if he has not already done so, within a period of two months from today. Since the third respondent has already taken a definite stand in the matter, the interests of justice require, that the matter should be heard by a superior authority. The Deputy Chief Engineer (Electrical), Kottayam will thereof consider the objections and pass order in accordance with law. 14. O.P. No. 3005 of 1983 is therefore allowed in the manner indicated above. 15. The facts in O.P. No 2866 of 1983 are similar. I qash Exts. P1 and P2 (a). 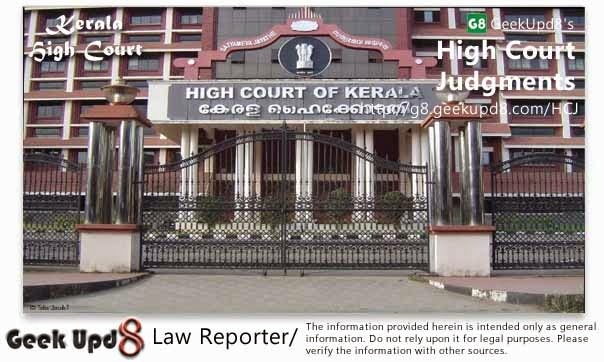 The respondents shall afford opportunity to the petitioner to be heard before visiting with the liability and the petitioners objections, if filed, shall be considered and disposed of by the Deputy Chief Engineer (Electrical), Kottayam with opportunity to the petitioner to be heard. O.P. No. 2866 of 1983 is allowed as stated above. Issue photo copy of the judgment on usual terms.